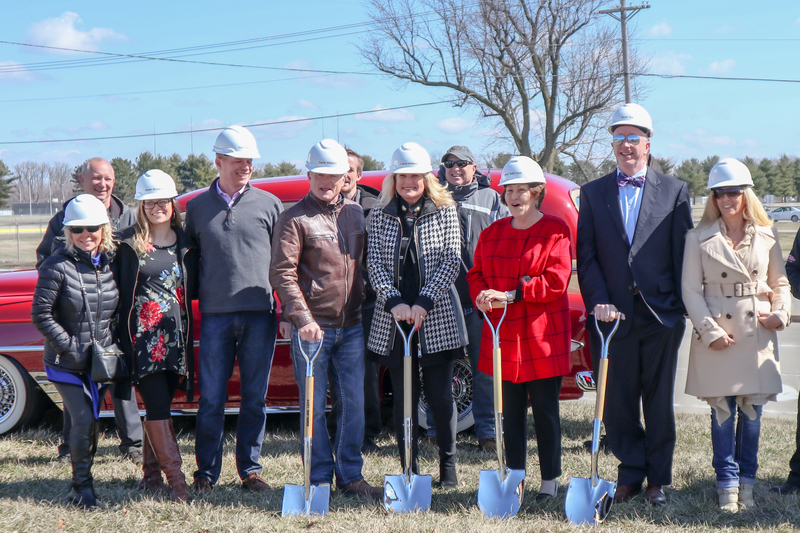 David and Laura Williams were joined today by St. Charles Mayor Sally Faith, Greater St. Charles Chamber of Commerce President Scott Tate, Greater St. Charles Chamber of Commerce staff, ambassadors, and members, as well as Duggan Contracting representatives and the rest of the Fast Lane family to break ground on the newest building on the Fast Lane Classic Cars campus! Since 1994 Fast Lane Classic Cars has strived to be the nation’s premier classic car dealership. Our campus has grown to four buildings and our services have expanded to include service and maintenance, detail, a huge gift shop, and an event space that overlooks our main showroom. David and Laura are continuing this tradition of growth by constructing our fifth building that will allow us to carry more cars and expand our service and maintenance capacity. The building is scheduled to be completed in Fall 2018, and will be located on our campus at 427 Little Hills Industrial Boulevard in St. Charles, Missouri. The 12,000 square foot building will house a new showroom, offices, and expanded service and maintenance facilities. Construction will be completed by Duggan Contracting Corp. and design was completed by DD Design & Planning, LLC, Bax Engineering, and AEdifica Case Engineering. Watch for construction and grand opening updates here on the blog or the Fast Lane Classic Cars YouTube channel. You can also Like us on Facebook or subscribe to have updates sent straight to your inbox!